This novel takes us into a not too distant future where humans have all but died out due to a plague. Snowman, formally known as Jimmy, is the only one left alive that he is aware of. He lives among the “Children of Crake” who are green-eyed, plant and grass eating, gentically engineered human-like beings who have little understanding of the world as the rest of mankind knew it. The book goes back and forth between Jimmy’s former life and friendship with his brilliant buddy Crake, and his new life as Snowman, which he now must adapt to. Slowly, mysteries are unturned and through flashbacks it is revealed just how the world had come to be the unfamiliar place that Snowman must now struggle to survive in. Fans of dystopian fiction will rejoice after reading this brilliantly crafted work of fiction. Atwood had an amazing way of building curiousity in me with each new detail in this frightening futuristic world. With each chapter a little bit more of the mystery was revealed, making me turn page after page with anticipation of what was to come next. Throughout the novel, I learned a lot about the characters of Jimmy, Snowman, and Oryx. I will say I didn’t care all that much for any of them as people, although their character development was important in the story. None of them were all that loveable, but that did not detract me from being interested in their tales. Even more important to me than them as people were the world they lived in and the interactions they had with this place where animals were being mixed into things like raknunks (racoon and chipmunk) and wolvogs (wolves and dogs), people either lived in secure, wealthy compounds or the dangerous pleeblands, and the coasts of the US have sunk into the ocean long ago. This book made me think about the future of science and technology. It’s already pretty scary what can be done with the information we have. Obviously science and technology have improved our world in many ways, but this book asks the question, “Where do we draw the line?” The world described in Oryx and Crake makes it believable that the continuance of advancement in these fields could potentially lead to disaster. A book talk could go on and on with this one. I have read “The Handmaid’s Tale” by Atwood, which is another dystopian novel that I really enjoyed. However, I think Atwood far exceeded her own genius in Oryx and Crake! I’m looking forward to “The Year of the Flood” which takes place in the same dystopian world I have just been introduced to. 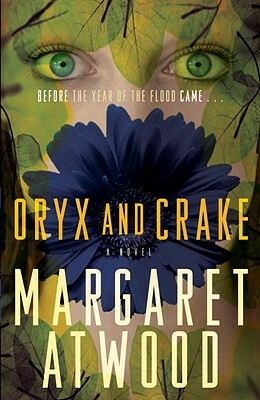 I would highly recommend Oryx and Crake to anyone that enjoys the genre of dystopian fiction. If you enjoyed A Handmaid’s Tale, you might like this one as well. It is very different, but as I said, I liked it even more! Have you read any other Atwood? I’ve had Handmaid’s Tale on my TBR pile for far too long so I will need to read that before this one! OK, first off – I didn’t really read this post because I reallyreallyreally hope to read this in the next 60 days and I just can’t wait to start it. 🙂 You are reading such cool books! I tried not to give too much away in the post, but definitely read this book! It is great! I want to read The Year of the Flood, a follow up to this book, soon!